« Top Posts of 2012 and a Giveaway! So who’s planning to start the year with some healthy eating? You too? Well I guess we’re all in the same boat here. Good news, I’ve got the most delicious salad I’ve ever made to share with you today. Y’know how some people say that diet food doesn’t taste good? Well. That isn’t true. And I’m going to prove it to you as soon as you taste this salad. Let’s first step back so I can tell you what it’s like to live in my head. It was about 2 in the morning and I was finally drifting off to sleep. Sadly for me, this is the time of day when I often have my best ideas. (Does this happen to anyone else?!) So there I am in bed, and I have this super cool idea. What would happen, I wonder, if I make a vinaigrette with actual peanuts in it? I loved the idea, but I had a dilemma. If I rolled over and went to sleep, I might never remember this amazing idea again. But if I wake myself up enough to turn my phone on and write a note, it will be forever before I get to sleep again. Eventually, good food won over sleep. (Are you starting to see a pattern emerge here? No? Good.) I wrote the idea down, then finally got to sleep. I may have been extra tired the next day, or maybe I was just dreaming about the fabulous salad I was planning to make. Either way, all of this was worth it, because I’ve got the most amazing salad recipe to share with you folks. I may or may not have made it four times already. But like I said, make this and you’ll understand everything. Dieting tastes good. I promise. Feel free to adjust the veggies according to your liking! 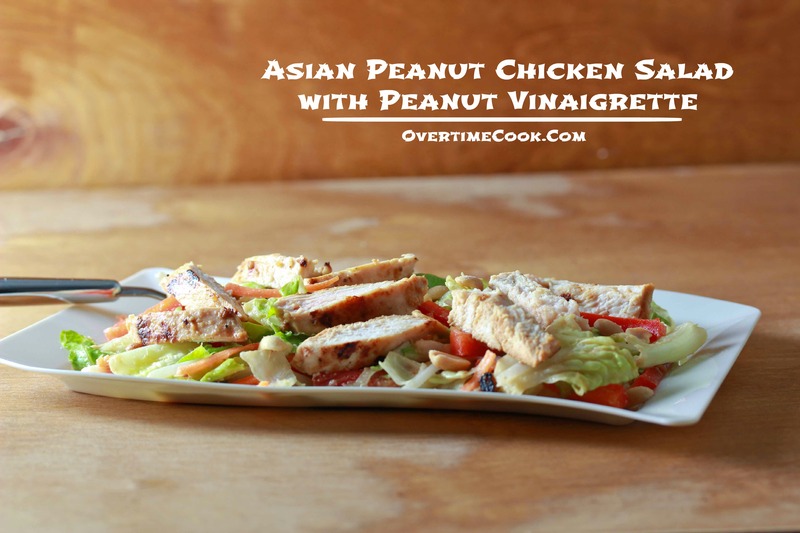 Marinate the chicken in a quarter of a cup of the peanut vinaigrette. (Reserve the rest to use as salad dressing.) Let the chicken marinate for a couple of hours. Grill or pan fry (spray is enough, no need for additional oil) the chicken on a medium low flame until lightly browned on both sides and cooked through. Remove from the pan and set aside to cool slightly. Cut the chicken into cubes. Set aside. 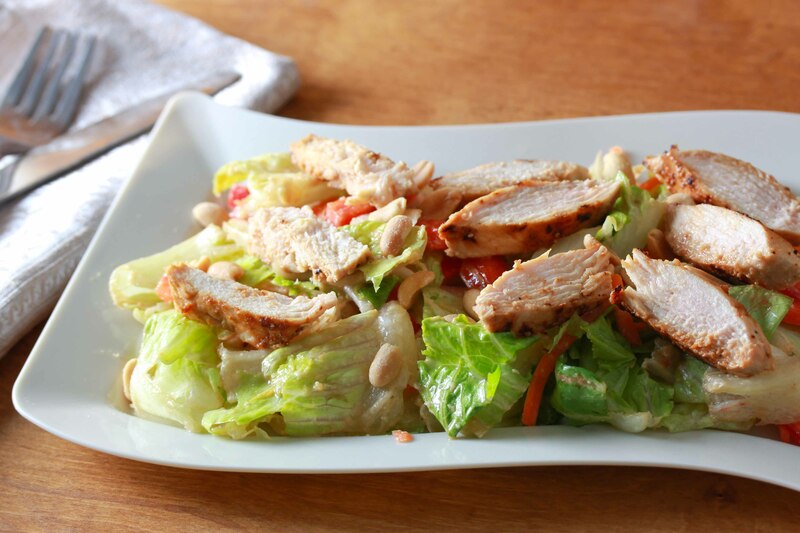 In a large bowl, combine the lettuce, vegetables, cubed chicken and remaining dressing. Toss to coat everything with the dressing. Top with peanuts. 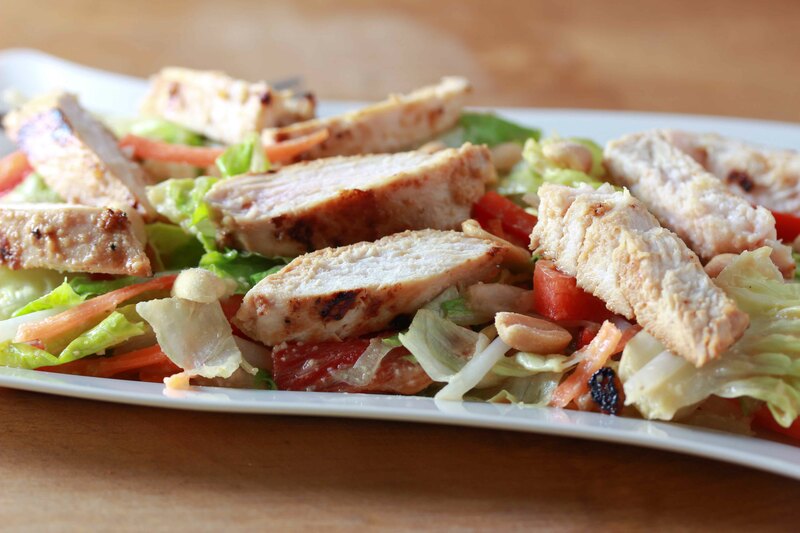 Note: for a fancier presentation, slice the chicken and serve on top of the salad. PS: Did you know I am giving away a copy of my favorite source of cookie recipes? Yep! Go enter! I do that, too, all the time! I have my best ideas right before bed or in the middle of the night. Life of a foodie, right? looks AWESOME!!!!! Can’t wait to taste it…..
YUM! One of my favorite restaurants just closed and they made the BEST Asian chicken salad. I’ve been dying to recreate it at home since I can’t get it there anymore! Thanks for the recipe! Fabulous!!! And you are not the only one with late night ideas… They are always the best. Funny, I was just looking for a peanut dressing recipe! This looks wonderful! Sounds wonderful, I love this kind of salad. do you think i can replace the honey for agave? Can I use fresh ground peanuts that is already in peanut butter form since it goes in the blender anyway? can i marinate the chicken overnight? Can I bake the chicken? and Can chunky peanut butter be substituted? – if so, How much? Yes I did it and it was great.